Partly funded jointly by NEDO (Japan’s New Energy and Development Technological Organization) and the European Commission, the meeting gathered representatives from all the companies and research centres involved. In the European side IES-UPM (Spain), Fraunhofer-ISE (Germany), ENEA (Italy), Imperial College (UK), CEA-INES (France) and the companies BSQ Solar (Spain) and PSE (Germany). From Japan the project counts with participation of University of Tokyo, Kobe University and University of Miyazaki, as well as companies Sharp, Takano, Asahi Kasei, and Daido Steel, and research centres AIST and Toyota Technological Institute. The European section of the consortium is led by Professor Antonio Luque of IES-UPM and the Japanese by Professor Masafumi Yamaguchi. 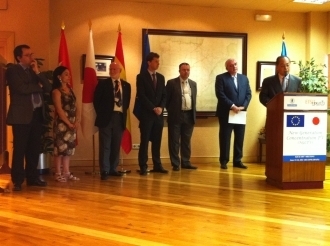 The opening ceremony that took place on the 14th counted with the participation of the Rector of the Universidad Politécnica de Madrid, Professor Javier Uceda, and the Ambassador of Japan to Spain, Mr. Fumiaki Takahashi, as well as the Director for R&D of the Autonomous Government of Madrid, Mr. Jorge Sainz, the Director of the CDTI (Spain’s Centre for Industrial and Technological Development), Dr. Arturo Azcorra, and the representative of the European office of NEDO , Ms. Setsuko Wakabayashi and of the European Commission Ms. Maria Gestiou, and the Director of the School of Telecommunication Engineering of UPM where IES-UPM is located, Professor Guillermo Cisneros.